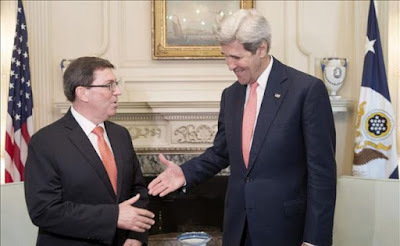 Gaspar, El Lugareño: John Kerry: "... it’s an historic day; a day for removing barriers"
John Kerry: "... it’s an historic day; a day for removing barriers"
SECRETARY KERRY: Good afternoon, everybody. I am very, very pleased this afternoon to welcome to the State Department my colleague, Bruno Rodriguez, the foreign minister of Cuba. And I apologize for our being a little bit late, but we were downstairs – we had a lot to talk about, not just about U.S.-Cuba relations but also about the region – and think we had a very constructive conversation. This is the first visit to the Department of State by a Cuban foreign minister since 1958, and today marks as well the resumption of normal diplomatic ties between our countries and the re-opening of our embassies after a rupture that has lasted 54 years.